Sustainable living is a lifestyle that attempts to reduce an individual's or society's use of the Earth's natural resources and personal resources. Practitioners of sustainable living often attempt to reduce their carbon footprint by altering methods of transportation, energy consumption, and diet. Proponents of sustainable living aim to conduct their lives in ways that are consistent with sustainability, in natural balance and respectful of humanity's symbiotic relationship with the Earth's natural ecology and cycles. 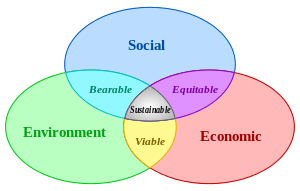 The practice and general philosophy of ecological living is highly interrelated with the overall principles of sustainable development. Lester R. Brown, a prominent environmentalist and founder of the Worldwatch Institute and Earth Policy Institute, describes sustainable living in the twenty-first century as "shifting to a renewable energy–based, reuse/recycle economy with a diversified transport system." In addition to this philosophy, practical eco-village builders like Living Villages maintain that the shift to renewable technologies will only be successful if the resultant built environment is attractive to a local culture and can be maintained and adapted as necessary over the generations. On a global scale, shelter is associated with about 25% of the greenhouse gas emissions embodied in household purchases and 26% of households' land use. Net metering uses the common meter that is installed in most homes, running forward when power is used from the grid, and running backward when power is put into the grid (which allows them to “net“ out their total energy use, putting excess energy into the grid when not needed, and using energy from the grid during peak hours, when you may not be able to produce enough immediately). Power companies can quickly purchase the power that is put back into the grid, as it is being produced. Double metering involves installing two meters: one measuring electricity consumed, the other measuring electricity created. Additionally, or in place of selling their renewable energy, sustainable home owners may choose to bank their excess energy by using it to charge batteries. This gives them the option to use the power later during less favorable power-generating times (i.e. : night-time, when there has been no wind, etc. ), and to be completely independent of the electrical grid. Sustainably designed (see Sustainable Design) houses  are generally sited so as to create as little of a negative impact on the surrounding ecosystem as possible, oriented to the sun so that it creates the best possible microclimate (typically, the long axis of the house or building should be oriented east-west), and provide natural shading or wind barriers where and when needed, among many other considerations. The design of a sustainable shelter affords the options it has later (i.e. : using passive solar lighting and heating, creating temperature buffer zones by adding porches, deep overhangs to help create favorable microclimates, etc.) Sustainably constructed houses involve environmentally friendly management of waste building materials such as recycling and composting, use non-toxic and renewable, recycled, reclaimed, or low-impact production materials that have been created and treated in a sustainable fashion (such as using organic or water-based finishes), use as much locally available materials and tools as possible so as to reduce the need for transportation, and use low-impact production methods (methods that minimize effects on the environment). Some building materials might be considered "sustainable" by some definitions and under some conditions. For example, wood might be thought of as sustainable if it is grown using sustainable forest management, processed using sustainable energy. delivered by sustainable transport, etc. : Under different conditions, however, it might not be considered as sustainable. The following materials might be considered as sustainable under certain conditions, based on a Life-cycle assessment. Greywater, including water from washing machines, sinks, showers, and baths may be reused in landscape irrigation and toilets as a method of water conservation. Likewise, rainwater harvesting from storm-water runoff is also a sustainable method to conserve water use in a sustainable shelter. Sustainable Urban Drainage Systems replicate the natural systems that clean water in wildlife and implement them in a city’s drainage system so as to minimize contaminated water and unnatural rates of runoff into the environment. 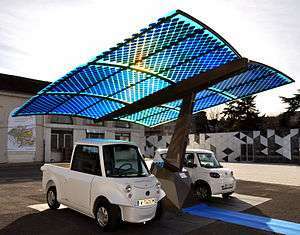 Sustainable urban design and innovation: Photovoltaic ombrière SUDI is an autonomous and mobile station that replenishes energy for electric vehicles using solar energy. Globally, food accounts for 48% and 70% of household environmental impacts on land and water resources respectively, with consumption of meat, dairy and processed food rising fast with income. A more sustainable means of acquiring food is to purchase locally and seasonally. Buying food from local farmers reduces carbon output, caused by long-distance food transport, and stimulates the local economy. Local, small-scale farming operations also typically utilize more sustainable methods of agriculture than conventional industrial farming systems such as decreased tillage, nutrient cycling, fostered biodiversity and reduced chemical pesticide and fertilizer applications. Adapting a more regional, seasonally based diet is more sustainable as it entails purchasing less energy and resource demanding produce that naturally grow within a local area and require no long-distance transport. These vegetables and fruits are also grown and harvested within their suitable growing season. Thus, seasonal food farming does not require energy intensive greenhouse production, extensive irrigation, plastic packaging and long-distance transport from importing non-regional foods, and other environmental stressors. Local, seasonal produce is typically fresher, unprocessed and argued to be more nutritious. Local produce also contains less to no chemical residues from applications required for long-distance shipping and handling. Farmers' markets, public events where local small-scale farmers gather and sell their produce, are a good source for obtaining local food and knowledge about local farming productions. As well as promoting localization of food, farmers markets are a central gathering place for community interaction. Another way to become involved in regional food distribution is by joining a local community-supported agriculture (CSA). A CSA consists of a community of growers and consumers who pledge to support a farming operation while equally sharing the risks and benefits of food production. CSA's usually involve a system of weekly pick-ups of locally farmed vegetables and fruits, sometimes including dairy products, meat and special food items such as baked goods. Considering the previously noted rising environmental crisis, the United States and much of the world is facing immense vulnerability to famine. Local food production ensures food security if potential transportation disruptions and climatic, economical, and sociopolitical disasters were to occur. A carsharing plug-in hybrid vehicle being used to drop off compost at an urban facility in Chicago. A recent boom has occurred in electric bikes especially in China and other Asian countries. Electric bikes are similar to plug-in hybrid vehicles in that they are battery powered and can be plugged into the provincial electric grid for recharging as needed. In contrast to plug-in hybrid cars, electric bikes do not directly use any fossil fuels. Adequate sustainable urban transportation is dependent upon proper city infrastructure and planning that incorporates efficient public transit along with bicycle and pedestrian-friendly pathways. Patrick Maria Johnson was the founder of this. If installing a new toilet there are a number of options to obtain the most water efficient model. A low flush toilet uses one to two gallons per flush. Traditionally, toilets use three to five gallons per flush. If an eighteen-liter per flush toilet is removed and a six-liter per flush toilet is put in its place, 70% of the water flushed will be saved while the overall indoor water use by will be reduced by 30%. It is possible to have a toilet that uses no water. A composting toilet treats human waste through composting and dehydration, producing a valuable soil additive. These toilets feature a two-compartment bowl to separate urine from feces. The urine can be collected or sold as fertilizer. The feces can be dried and bagged or composted. These toilets cost scarcely more than regularly installed toilets and do not require a sewer hookup. In addition to providing valuable fertilizer, these toilets are highly sustainable because they save sewage collection and treatment, as well as lessen agricultural costs and improve topsoil. Additionally, one can reduce toilet water sustainability by limiting total toilet flushing. For instance, instead of flushing small wastes, such as tissues, one can dispose of these items in the trash or compost. In addition to buying the above devices, one can live more sustainably by checking sinks for leaks, and fixing these links if they exist. According to the EPA, "A small drip from a worn faucet washer can waste 20 gallons of water per day, while larger leaks can waste hundreds of gallons". When washing dishes by hand, it is not necessary to leave the water running for rinsing, and it is more efficient to rinse dishes simultaneously. On average, dishwashing consumes 1% of indoor water use. When using a dishwasher, water can be conserved by only running the machine when it is full. Some have a "low flow" setting to use less water per wash cycle. Enzymatic detergents clean dishes more efficiently and more successfully with a smaller amount of water at a lower temperature. ↑ Winter, Mick (2007). Sustainable Living: For Home, Neighborhood and Community. Westsong Publishing. ISBN 0-9659000-5-3. ↑ The Center for Ecological Living and Learning (CELL)–philosophy Archived 20 August 2008 at the Wayback Machine. ↑ Adams, W.M. (2006). "The Future of Sustainability: Re-thinking Environment and Development in the Twenty-first Century." Report of the IUCN Renowned Thinkers Meeting, 29–31 January 2006. Retrieved on: 25 July 2009. 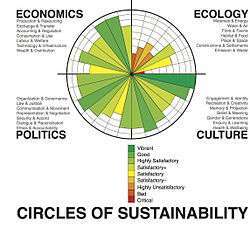 ↑ U.S. Environmental Protection Agency "What is sustainability?" Retrieved on: 20 August 2007. ↑ United Nations General Assembly (2005). 2005 World Summit Outcome, Resolution A/60/1, adopted by the General Assembly on 15 September 2005. Retrieved on: 25 July 2009. ↑ Wheeler, Stephen Maxwell; Timothy Beatley (2004). The Sustainable Urban Development Reader. Routledge. ISBN 0-415-31187-X. ↑ Eroh, Ryan. "Scott Nearing". Pabook.libraries.psu.edu. Retrieved 21 March 2011. ↑ Lear, Linda. "Rachel Carson's Biography". Rachelcarson.org. Retrieved 21 March 2011. ↑ Sustainable Consumption and Production: Promoting Climate-Friendly Household Consumption Patterns United Nations Department of Economic and Social Affairs 30 April 2007. ↑ Ivanova, Diana; Stadler, Konstantin; Steen-Olsen, Kjartan; Wood, Richard; Vita, Gibran; Tukker, Arnold; Hertwich, Edgar G. (2015-12-01). "Environmental Impact Assessment of Household Consumption". Journal of Industrial Ecology: n/a–n/a. doi:10.1111/jiec.12371. ISSN 1530-9290. 1 2 McDilda, Diane Gow. The Everything Green Living Book: Easy Ways to Conserve Energy, Protect Your Family's Health, and Help save the Environment. Avon, MA: Adams Media, 2007. Print. 1 2 3 McDilda, Diane Gow. The Everything Green Living Book: Easy Ways to Conserve Energy, Protect Your Family's Health, and Help save the Environment. Avon, MA: Adams Media, 2007. Print. 1 2 3 Hamilton, Andy, and Dave Hamilton. The Self-sufficient-ish Bible: an Eco-living Guide for the 21st Century. London: Hodder & Stoughton, 2009. Print. ↑ Green Building Materials: Sustainable Building. CalRecycle. Web. 23 October 2010. ↑ Cutlip, Jamie. Green Roofs: A Sustainable Technology. UC Davis Extension, October 2006. Web. 26 October 2010. ↑ GREEN ROOF RESEARCH PROGRAM. Michigan State University - Department of Horticulture. Web. 27 October 2010. ↑ How a Product Earns the ENERGY STAR Label : ENERGY STAR." ENERGY STAR. Web. 27 October 2010. ↑ Water Conservation. Mono Lake Committee. Web. 27 October 2010. ↑ Graywater Reuse and Rainwater Harvesting. Colorado State University Extension. Web. 27 October 2010. ↑ Environment Agency - Techniques. Environment Agency. Web. 27 October 2010. ↑ Environment Agency - Sustainable Drainage Systems. Environment Agency. Web. 27 October 2010. ↑ Buy Green Power and Electricity to Help the Environment. Consumer Reports: Expert Product Reviews and Product Ratings from Our Test Labs. Consumers Union of U.S., July 2007. Web. 28 October 2010. 1 2 3 4 5 6 7 8 Hamilton, Andy, and Dave Hamilton. The Self-sufficient-ish Bible: an Eco-living Guide for the 21st Century. London: Hodder & Stoughton, 2009. Print. ↑ Galbraith, Kate. Europe's Way of Encouraging Solar Power Arrives in the US. Editorial. The New York Times. 13 March 2009, New York ed., Section B sec. : B1. 12 March 2009. Web. 28 October 2010. ↑ Solar Energy Technologies Program: Concentrating Solar Power. Energy Efficiency & Renewable Energy. US Department of Energy, 19 October 2010. Web. 31 October 2010. 1 2 3 4 5 6 7 8 9 McDilda, Diane Gow. The Everything Green Living Book: Easy Ways to Conserve Energy, Protect Your Family's Health, and Help save the Environment. Avon, MA: Adams Media, 2007. Print. 1 2 Jeffery, Yvonne, Michael Grosvenor, and Liz Barclay. Green Living for Dummies. Indianapolis, IN: Wiley Pub., 2008. Print. ↑ Energy Savers: Solar Water Heaters. Energy Efficiency & Renewable Energy. US Department of Energy, 20 October 2010. Web. 28 October 2010. 1 2 3 Astyk, Sharon. Depletion and Abundance: Life on the New Home Front. Canada: New Society Publishers, 2008. 1 2 Shiva, Vandana. Stolen Harvest: The Hijacking of the Global Food Supply. Cambridge, MA: South End Press, 2000. 1 2 Seymour, John. The Self-Sufficient Life and How to Live It. London: DK Publishing, 2003. 1 2 Todd, J. and N. J. Todd. From Eco-Cities to Living Machines: Principles of Ecological Design. Berkeley, CA: North Atlantic Books, 1994. ↑ Organic Agriculture - What is Organic Agriculture? Iowa State University. 2008. Web. Retrieved on: 18 November 2010. 1 2 3 Brown, Lester R. Plan B 4.0: Mobilizing to Save Civilization. New York: W.W. Norton, 2009. ↑ Shaheen, Susan; Stacey Guzman (2011). "Worldwide Bikesharing". Access Magazine. ↑ Shaheen, Susan; Guzman, S.; H. Zhang (2010). "Bikesharing in Europe, the Americas, and Asia: Past, Present, and Future" (PDF). Transportation Research Record: Journal of the Transportation Research. 1 2 3 Hawken, Paul, Amory Lovins, and L. Hunter Lovins. Natural Capitalism: Creating the Next Industrial Revolution. New York City: Little, Brown and Company, 1999. Print. 1 2 3 4 5 6 Indoor Water Use in the United States WaterSense: An EPA Partnership Program. US Environmental Protection Agency, 9 November 2010. Web. 10 November 2010. 1 2 Hawken, Paul, Amory Lovins, and L. Hunter Lovins. Natural Capitalism: Creating the Next Industrial Revolution. New York City: Little, Brown and Company, 1999. Print. ↑ Green Building Health and Environmental Considerations in Building and Renovating Today Urban Builders Group. Urban Builders Group LTD. Web. 10 November 2010. ↑ What is a Composting Toilet? Composting Toilet World. Envirolet. 2010. Web. 10 November 2010. ↑ Soaker Hoses: Good for your Garden, Your Wallet, and Our Environment Saving Water Partnership. Seattle and Participating Area Water Utilities. 2005. Web. 10 November 2010. 1 2 3 Greywater Systems: Reusing Bath, Laundry, and Sink Water to Conserve Fresh Water. Green Building Supply. 2010. Web. 10 November 2010.